In our previously published guides, we talked about installing Hadoop, installing Pig on own server. We also talked about free IBM Analytics Demo Cloud with needed softwares pre-installed, ready to use. 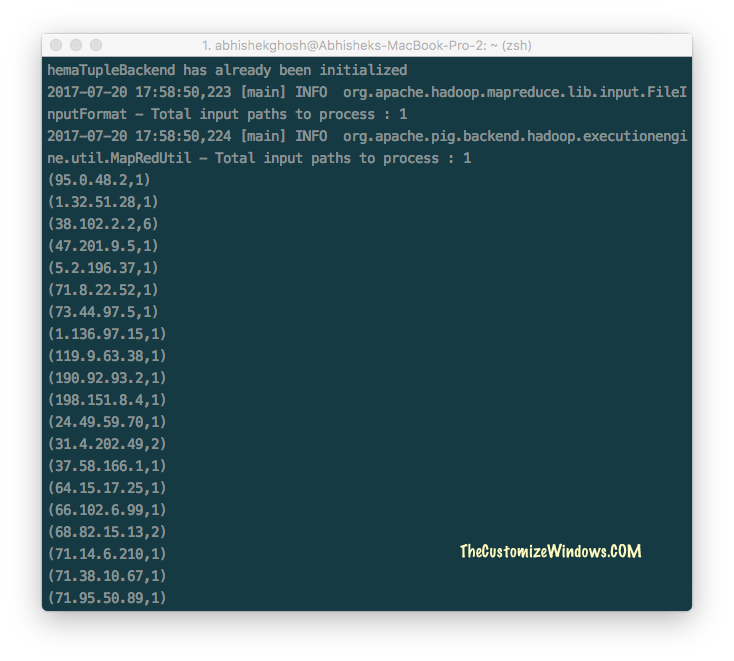 Here is basic example with commands to show how to process server log in Hadoop, Pig can be done using free IBM Analytics Demo Cloud. This guide can be followed by even who never used Hadoop or Pig. We collected a script for the easy work. We only can not supply our server log to you as IP address collected by our server is sensitive data and may be prohibited to share in EU countries to protect privacy of our readers. You need to collect Apache web server access log from somewhere to really follow this guide. First, SSH to IBM Analytics Demo Cloud. Then wget your access log file in your desired location, for us location is ~ aka $HOME aka where you’ll be after login via SSH. In our example, the access log file’s name is access.log.1. In case you are on SSH of your server, then use CLI FTP commands to upload (commands are under the sub header “Transfer FTP Files Directly From One Server to Another : Major Methods With Command Line”) the log to IBM Analytics Demo Cloud instance. Notice the above syntax – IP followed by number of times separated by comma. That is what was intended to show you a basic demo. How to embrace the Cloud Computing Concept Properly ? How to embrace the Cloud Computing Concept Properly is a Big Question stating from the developers to the managing director of a medium sized company. Cite this article as: Abhishek Ghosh, "How To Process Server Log in Hadoop, Pig : Free IBM Analytics Demo Cloud," in The Customize Windows, July 20, 2017, April 21, 2019, https://thecustomizewindows.com/2017/07/how-to-process-server-log-in-hadoop-pig-free-ibm-analytics-demo-cloud/.